Paris, France – June 28, 2018 – E-on software, a leading global developer of software for the creation, animation, rendering, and integration of natural 3D environments in the computer graphics, VFX, architecture, and gaming industries, today announced the immediate availability of Release 6 (R6) of its VUE and PlantFactory 2016 software. The free trial versions of its VUE 2016 and PlantFactory 2016 R6 software are also immediately available. 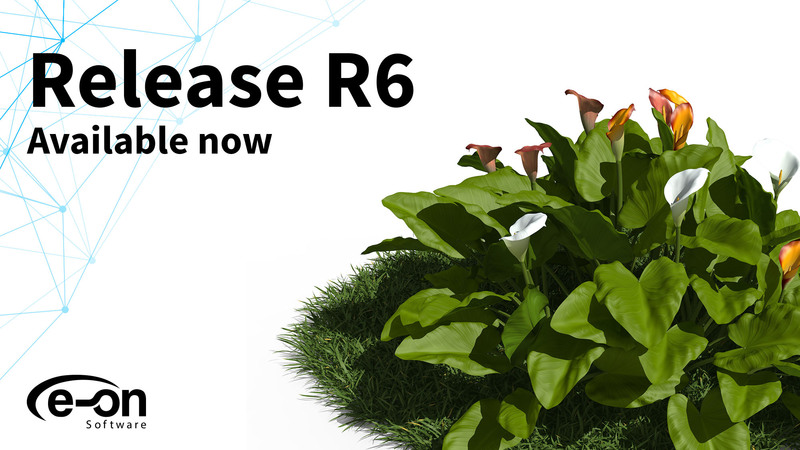 Release 6 (R6) is available as a free software update for all registered users of VUE and PlantFactory 2016. The 2016 R6 trial versions are also immediately available. Users can download the 2016 R6 trial versions at no charge from https://info.e-onsoftware.com/try. All VUE and PlantFactory 2016 software titles are available in English, French and German and perform under all versions of Windows 7, Windows 8, and Windows 10 (64 bit only), and Mac Intel (64 bit) for MacOSX 10.7+. More information on VUE 2016 and PlantFactory 2016 is available at: https://info.e-onsoftware.com/vue and https://info.e-onsoftware.com/plantfactory. E-on software is based in Paris, France. For more information visit https://info.e-onsoftware.com.